What's the major difference between a bay and bow window. If there's a cost difference between a bow and bay window. 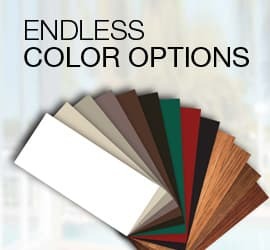 The options Stanek Windows has to offer. In our house, we have a great room with a little portative organ and a harpsichord. When we started planning our interior design, I decided that one of the things I really wanted was to make our music area as special as possible. We didn't have any extra space in the room, so we ended up choosing to install a sparkling new bay window. It juts out, so it actually gives us more interior space. And it fills the room with views of the landscaping beyond, reflected in its angled panes. The harpsichord curves nicely into the nook formed by the new bay window, and beckons us to come and play. 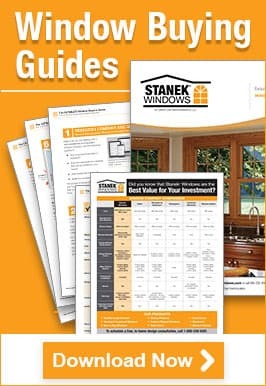 "A new bow or bay window immediately becomes the focal point for the home," says Sven Kramer, National Sales Manager of Stanek® Windows, by Great Day Improvements, LLC. "This is not just another window. It consists of a shell that projects outside the home and contains three or more panels of windows. A bow or bay window completely transforms both the interior and the exterior of the home." At first glance, bow and bay windows can look a lot alike. Both will do much to open up a room and let it breathe, giving the appearance of more space and letting in more light while adding a splash of glamour to any room. A bay window has three openings, available in angled projections. A bow window usually has four or five. 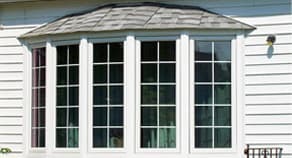 The angular lines and flat planes of a contemporary bay window are often considered more appropriate for modern homes, while the semi-circular outer structure of the bow window is ideal for any architecture that smacks of the Victorian. Of course, either type is perfectly acceptable for just about any style home. Bay windows protrude farther from the wall out into the exterior space, adding a bit more floor space on the interior. Because bay windows only have three panels, they're seldom as wide as bow windows. Bow windows can be wrapped around the corner of a building, forming a unique turret shape on the outside and an enticing nook on the inside. This advantageous option also allows for a view from two sides of the home. How about The Difference in Cost? The cost of a bow window runs approximately 2.5 times the cost of a similar flat window with the same-sized opening. That's because a bow window isn't a single window. In the case of Stanek® windows, the bow is a custom-made hardwood shell that's fitted with several custom windows. In addition, the installation of a bow window is more complex than the installation of a regular bay window. Bow window installations require a soffit tie-in or a new hip roof to properly seal out air and water. Inefficient windows have air leaks that assault your utility bills. When you make the choice to buy Energy Star certified windows, you'll see some major savings. In fact, the windows sometimes pay for themselves within just a few years. All Stanek® bay and bow windows are officially categorized as "energy efficient," so installing them brings more than charm and beauty into your home. You get the coveted Energy Star and NFRC independent ratings that raise the value of your property. You'll also save money on your heating and cooling bills, even as you're taking the planet-affirming high road. Sides are installed at the same angles and will be more shallow. "The shell is the key to a good bay/bow window," Kramer says. "It needs the proper structural integrity to support the heavy windows that it's housing. It also needs superior insulation, due to the fact that it's projecting outside the home. Think of a slab floor with no basement and how cold that floor is in the winter." Ultra Oak Veneer: This shell has a 1-1/4" seat with 3-1/2" oak casings. Ultra Elite Tongue & Groove: This shell offers solid, insulated tongue and groove hardwood flooring planks with furniture-grade 6" colonial stack casings. "Many consumers comment that their new bow or bay window adds more light into the home and expands the space in the room where they add a bay or bow unit," said Kramer. "The other often-heard comment is that it was an affordable enhancement to the home." 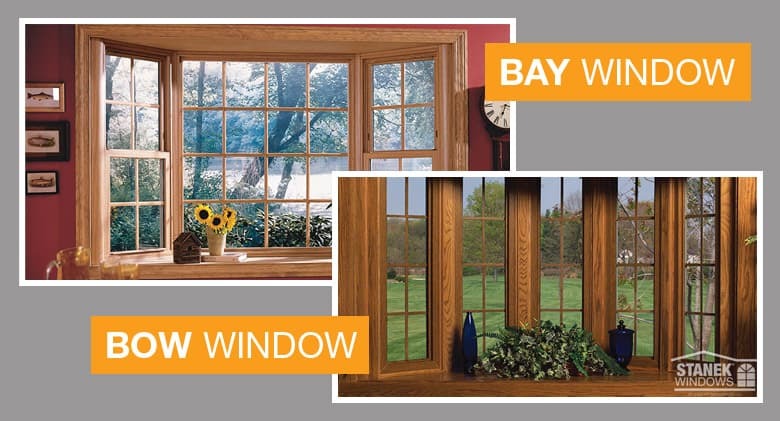 Replace picture windows, sliding windows and double-hung windows with our bay or bow windows, and choose from several different shapes customized for your individual preference. 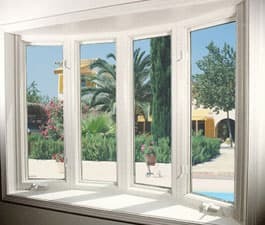 If you'd like some help deciding between bay and bow windows and want an accurate estimate on the spot, sign up for a free, no-obligation consultation.